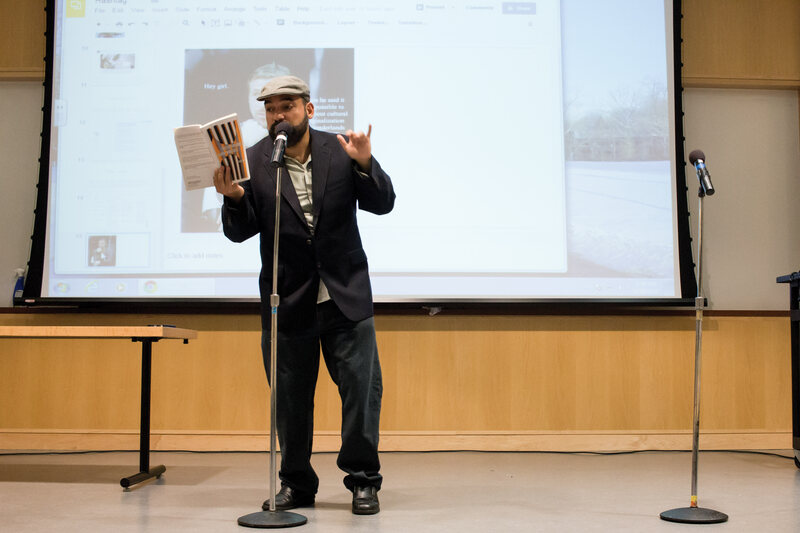 Students explored topics of race, immigration and Latino identity through poetry and social media last week during a program called “Hashtag Latinidades” in the Liberal Arts Building. Poet and New York University professor Urayoãn Noel led the Sept. 28 part-lecture, part-performance event, and his poetry analyzed social issues and constructs relating to minorities, focusing on the Latino and Latina community. Noel illustrated this thought through an improvisational piece that referenced his own background. “Forgive me if I start out with an improvisation, but I come from a nation called Puerto Rico, so our nations are improvised,” he said, singing his words. The meme was used to illustrate how “Dominican Twitter,” like “Black Twitter,” is often used to poke fun at racial stereotypes and cultural norms but can also be used to connect to different social movements. On a more serious note, Noel also showed a video titled “For Colored Boys Who Speak Softly.” The video featured spoken word poetry by queer Latino poet and activist Yosimar Reyes. Reyes’ poem responded to colonialism and ideals of masculinity enforced by western society. (“they burned our villages, nuestros pueblos/implemented homophobia, sexism, and machismo/in las cabezas de nuestros abuelos/brainwashed our ancestors into believing that boys like us are a manifestation of the devil”). Noel performed an original poem from one of his books that was inspired by his mom talking to her smartphone. Noel read a sonnet by 17th century Mexican writer Sor Juana Ines de la Cruz. His phone then incorrectly translated the sonnet to English. While he performed, Noel switched between two microphones to emphasize the difference between the line from the sonnet and the phone’s translation of the line. Cook Library sponsored “Hashtag Latinidades” as part of “Latino Americans: 500 Years of History” grant series.